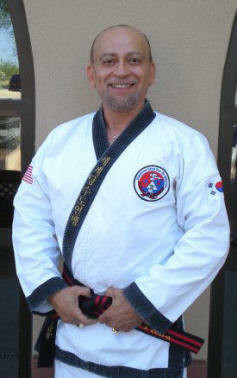 Grandmaster Darryl D. Khalid began his martial arts training in Korea in 1970, while stationed at Osan Air Force Base. His instructor was Master Chun Sik Kim. Grandmaster Khalid has served as the Defense Tactical Coordinator for Glendale Community College Police Reserve Academy, which serves the west side of Maricopa County in the State of Arizona. In 1987 he received the Master of the Year award from the World Tang Soo Do Association (WTSDA). In 1988 Master Khalid traveled with Grand Master Jae Chul Shin to China where they placed the first non-Chinese monument at the Shaolin Temple. In 1990 he became the chairperson of the self defense committee for the WTSDA developing new techniques for instructor training. As an ambassador of the WTSDA he was also sent to Magdan, Russia on a diplomatic tour, where he introduced Tang Soo Do to local police and schools from Kindergarten through 12th grade. In September of 1997 he formed his own organization, the Universal Tang Soo Do Alliance and currently serves as its president. He also operates Khalid's Martial Arts in Glendale, Arizona. Grandmaster Khalid was inducted into the World Black Belt Hall or Fame in 2010. In March 2014, Grandmaster Khalid was awarded his 9th Dan by his instructor Grandmaster Andy Ah Po.